Holiday.gr - Portaria, a trip to a myth! Portaria, the queen of Pelion as people call it, is one of the most beautiful villages of Magnesia Prefecture and of the first tourist resorts in Thessaly. It is a magnificent village built in a privileged location with an exceptional view of the Pagassitikos bay. 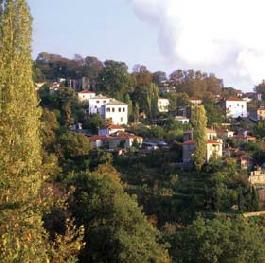 It is 14 km distance from Volos and 13 km from the ski center of Pelion. It is situated at a 650 m altitude and has magnificent view, as it combines in a unique way mountain and sea. Portaria is ideal for all year round vacation. It offers the serenity of the countryside and the beauty of nature. The traditional hostels and the locals offer a warm hospitality to all guests. While touring around Portaria you will see the stoned, well-preserved mansions, a true ornament for the village. Portaria was the most significant commercial center among the twenty four Pelion villages. Some of the most important mansions, which now house public services are: the Athanassakio Kindergarten, one of the first operated in Greece, the Zoulia Mansion, which operated as a Vocational School for girls, and the Tsopotio School, which now houses the Town Hall. It is worth visiting the churches and the monasteries in Portaria. Like the church of Aghios Nikolaos with the fretwork, at the Central Square. The chapel of Panagia Portarea with murals of the 16th century. It is said that Portaria took its name from this chapel. Also the monastery of Aghios Ioannis. The natural beauties impress every visitor. Take a walk at the famous "Centaurs' path" and relax. Take a picture by the "Karavos" Waterfall. Its waters come from “Pigi Mana”. Several cultural events are held all year round in Portaria. They aim in reviving customs and traditions. The revival of the Pelioritic Wedding in August is the most important event and also the closing ceremony of the cultural festival. It is celebrated on August 15th, with the participation of many local residents and visitors. Been to Portaria ? Share your experiences!